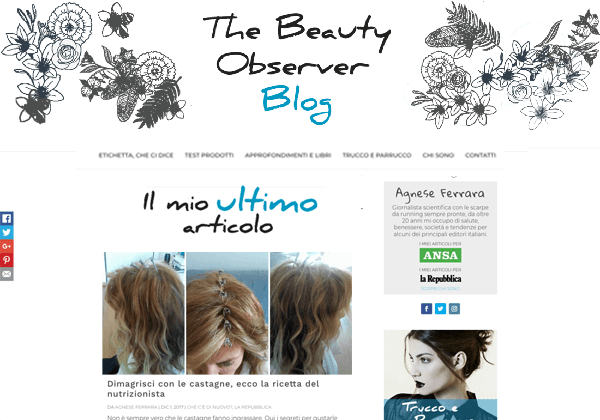 The Beauty Observer is a blog by the Italian journalist and book writer Agnese Ferrara. Our division Truly Social has been contacted by her roman agency to create a fresh, responsive and most of all well-optimized new design for her website, that very much needed a radical revamp. As part of the outsourced service, we also offered a few training sessions to bring the client up to date with the basics of internet marketing, SEO, optimized copywriting, as well as with a kick-off social media strategy designed around content marketing goals. Unfortunately, the client’s agency ended up imposing their “design views”, and as a result they have made some radical changes that have impacted the good work we did in terms of optimization and responsiveness – and, in some measure, also the beautiful work we created. The website design now online is still mainly our work.